Jean Cacharel, fall 2001 collection. serving as mayor, 1995-96; Cacharel headquarters moved from Nïmes to Paris, 1999; Clements Ribeiro design team signed to produce womenswear, 2000; accessories line launched, 2000; opened first "blue" décor store, Marseilles, 2001; fragrances (licensed to L'Oreal) include: Anaïs Anaïs, 1978; Cacharel pour Homme, 1981; Loulou, 1987; Eden, 1994; Loulou Blue, 1995; Eau d'Eden, 1996; Noa, 1998; Nemo, 1999. Awards: Export Trade Oscar, Paris, 1969; FiFi "Star of the Year" award for both Best New Fragrance and Best Fragrance Launch (for Noa, ), 1998. Address: 3 Rue du Colisée, 30931 Nïmes, France. Website: www.cacharel.com . Lynam, Ruth, Paris Fashion: The Great Designers and Their Creations, London, 1972. Manser, José, "Cacharel's Rag Trade Riches," in Design (London), October 1969. Raper, Sarah, "Cacharel to Sell Temptation with Eden," in Women's Wear Daily, 7 January 1994. Aktar, Alev, "Loulou Blue Looks to Youth to Color Sales," in Women's Wear Daily, 10 March 1995. Lewis, Madeleine, "Profiles of Jean Cacharel, Gerard Pasquier and Zannier," in Textile Outlook International, May 1995. Cooney-Curran, Joyceann, "Noa's Mystique: With a Message and Vision in Hand, Noa Takes on the U.S. Fragrance Market," in Global Cosmetics Industry, April 2000. Weisman, Katherine, and James Fallon, "Clements Ribeiro to Do Cacharel Line," in Women's Wear Daily, 18 May 2000. Murphy, Robert, "Catching Up with the New Cacharel," in Women's Wear Daily, 9 August 2000. Deeny, Godfrey, "Cacharel Cashes in on Couture," available online at Fashion Windows, www.fashionwindows.com , 10 March 2001. Murphy, Robert, "Cacharel's New Blue Horizon," in Women's Wear Daily, 15 May 2001. Nelson, Karin, "Cacharel: Colorful & Spirited," available online at Fashion Windows, www.fashionwindows.com , 6 October 2001. Jean Cacharel in ca. 1980-97. "Cacharel." The designer had finally done for women what others had not—created a shirt that was flattering, comfortable and easy to wear. 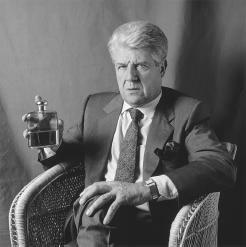 Cacharel, Jean Bousquet, came to Paris from Nïmes in the mid-1950s, where he had apprenticed in men's tailoring. Adopting the name of Cacharel, which was taken from the Camargue's native wild duck, he moved into womenswear as a designer/cutter for Jean Jourdan in Paris. At the time womenswear was dominated by Parisian haute couture and mass market took a dim second place. Cacharel was one of the first designers to foresee a fashion future beyond the oldmonied clientéle and catered to an emerging nouvelle riche and fashion-conscious mass market. The strong emergence of youth culture in the 1950s and 1960s strengthened his vision. Cacharel opened his own business at the end of the 1950s and employed Emmanuelle Khanh as a stylist and designer. Together they created a company image that was very French, young, and sporty in fresh matching separates that were colorful, pretty and wearable. Success was sealed in 1965 when Cacharel began working with Liberty of London. He rescaled and recolored traditional floral prints so they became softer and more flattering. Prints previously scorned as frumpy and homely were transformed by Cacharel's cut and taste into snappy, feminine, wearable clothes. Liberty of London subsequently stocked and sold the Cacharel label for decades. Further developments at Cacharel included moves into licensing and distribution agreements. Cacharel's sister-in-law, Corinne Grandval, joined the firm and helped introduce a successful mini couture line for children, which was widely copied and adapted in the industry. Cacharel's children, Guillaume and Jessica, also joined the family business in the 1990s. Yet by the turn of the century, the Cacharel name needed a boost. Though it still represented stylish ready-to-wear for women in France and throughout Europe and Latin America, the name was recognizable only in fragrances in the United States. Setting out to crack the American market and spruce up its image, Cacharel decided to launch new versions of two if its earlier fragrances. Cacharel's Loulou and Eden came out in 1987 and 1994 respectively; their younger, hipper counterparts, Loulou Blue and Eau d'Eden debuted in 1995 and 1996. The introductions, however, came at difficult time for the company, as its namesake was on trial for misdeeds while the mayor of Nïmes, where the business was based. Subsequently convicted, Jean Cacharel was fined and sentenced to a year in jail, followed by a year of probation. Cacharel, the business, continued during its founder's confinement. In 1998 came the launch of Noa, an exciting fragrance and body products line symbolizing female empowerment and spiritual harmony. Its mate, the first Cacharal men's fragrance in almost two decades, Nemo, came out the following year. The complementary scents, like all of Cacharel's later fragrances, were directed at a youthful crowd complete with flashy packaging and aggressive advertising campaigns. Boldly going against the unisex fragrance trend, Cacharel's distinctly male and female scents were a welcome hit in the U.S., which had proven resistant to earlier Cacharel fragrances (with the exception of Anaïs Anaïs which had been an enduring success). While Noa brought the Cacharel name to the forefront of the fragrance industry, with mega sales worldwide, Cacharel's womenswear was bolstered with arrival of the Clements Ribeiro design team in 2000. Husband-and-wife team Suzanne Clements and Inacio Ribeiro's ready-to-wear collections in 2000 and 2001 were warmly received. While the duo continued to design under their own label as well as at Cacharel, Clements commented to Women's Wear Daily in August 2000, "Now we can be more whimsical and extreme with Clements Ribeiro. Cacharel, on the other hand, is more grounded in reality. It is more simple and has pieces, like suits, that we wouldn't do for our own line, but that are important for Cacharel because it is a full collection with an economic reality." Under the artistic direction of Clements and Ribeiro, the 40-year-old house of Cacharel was in good hands. The company's founder, Jean Cacharel said, "Clements and Ribeiro have tapped into the true Cacharel spirit. The line is about creative pieces that can be easily mixed and matched—all at an affordable price." In addition to reinvigorating its ready-to-wear and other clothing collections, Cacharel introduced matching accessories and opened a new store in Marseilles in 2001. The new décor, almost completely outfitted in various shades of blue, was another step in redefining Cacharal worldwide, with the remainder of firm's shops slated for renovation in 2001 and 2002.